Seen by Thousands of Potential Customers Each Day! 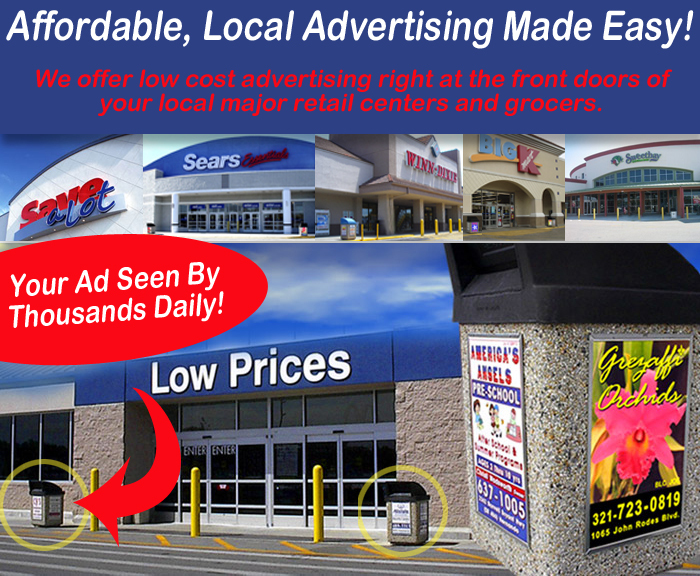 We offer low cost advertising right at the front doors of your local major retail centers and grocers. a sturdy fire/hurricane proof stone decorative litter container. Every customer that enters the store will pass within feet of your sign. We offer a 6 or 12 month option for a very low price. Just think what a full size newspaper ad would cost...with Market Concepts, Inc. you pay less and get 6 months to a full year of valuable, local advertising! Our graphics design team provides you with a state of the art business sign - view our Gallery for samples & ideas! Our signs are printed on high quality vinyl and laminated for UV protection - extremely durable even in Florida's hot summer sun!